This entry was posted on 27/03/2017, in Corruption and Cheat, Editorials, Ethics | Morals, Judiciary, News | Newsmakers and tagged justice, Korea, Park. Bookmark the permalink. The prosecution requested an arrest warrant for former President Park Geun-hye on Monday. Park is being investigated as a suspect in the corruption scandal which led to her impeachment. She faces 13 charges, including bribery. 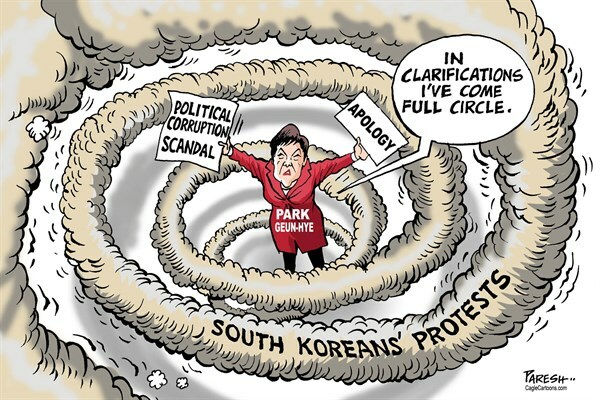 The decision to seek the arrest of Park is fair and justifiable, considering her former aides and government officials are being tried in detention in connection with the scandal. Since Samsung Electronics Vice Chairman Lee Jae-yong has been arrested on charges including one of offering bribes to Park, it would be unfair not to apply for an arrest warrant for Park, who was allegedly at the receiving end of the bribery. She is the third former president who the prosecution has sought to detain for investigation, after former Presidents Chun Doo Hwan and Roh Tae-woo. Though the request for the arrest of a former leader dishonors the constitutional history of the nation, the prosecutors’ decision appears inevitable and necessary to maintain law and justice. Prosecutor General Kim Soo-nam has said the matter will be decided based on the law, legal principles and the progress of related investigations. A fair decision should be made in strict accordance with the law, not with political consideration or based on public sentiment. The request for the detention of the ex-president will serve as a precedent that demonstrates the independence of the prosecution, which opposition lawmakers have criticized for being influenced by the executive. The prosecutors’ decision is worth being recorded as a milestone to solidify the rule of law. Park denies all 13 charges, the most among the three former presidents. She argues she has never colluded with her confidante Choi Soon-sil for personal gains, but from a legal point of view, the request for her arrest looks inevitable. If the court convicts her of the charges, in particular bribery, the sentence would likely be heavy. It was appropriate for the prosecution to cite her denial of all charges as a risk of evidence destruction. Generally, in a criminal case, a defendant is usually investigated without detention, unless there is a risk of flight or evidence destruction. However her flat denial of charges arouses suspicion she may seek to destroy any evidence against her. The prosecution’s decision is also in line with public opinion, too. Polls show that about 60 to 70 percent of the people want her to be detained like other suspects in the case. The request for an arrest warrant for Park came five days after she was questioned on March 21 and 22. The quick decision to seek to arrest her is appropriate, considering the possible effect of her detention on the presidential election less than 50 days away. Political parties here are scheduled to pick their candidates by early next month and official campaigns will begin on April 17. The prosecution is expected to indict Park before the campaign starts. The trial is likely to kick off after the presidential election, considering the political sensitivity of the case. All eyes are now on what decision the court will make. All judgement in the court should be made independently and free of outside pressure. What’s concerning is civic groups or politicians who may try to use the issue as a pretext to instigate social conflict for their political benefit. They should abandon attempts to influence the court’s decision. No matter what the court decides regarding the arrest of Park, it should be made wholly on its own and be respected. The nation expects the court to make a decision according to the law and principles. It is time to calmly watch the court and be ready to respect its decision.